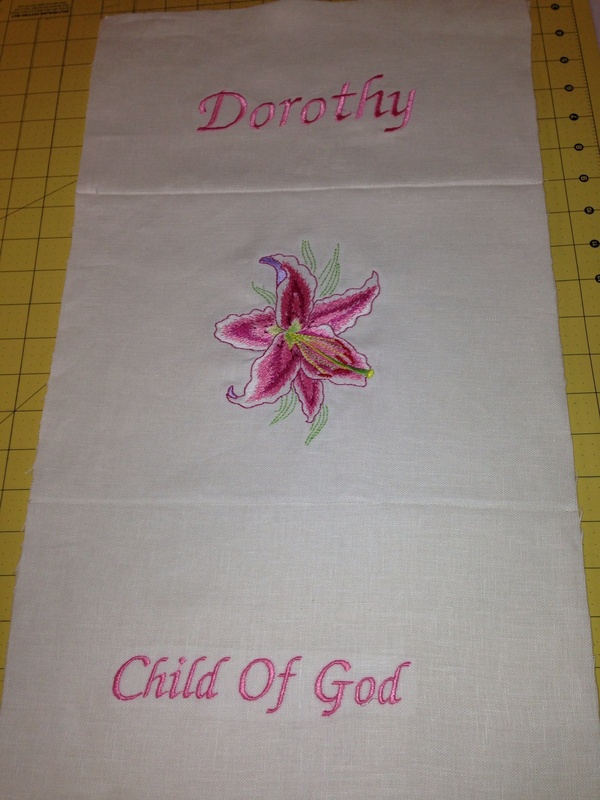 I am making my mother, who lives on a skilled nursing floor, a door hanging for her room, for her birthday wich is next Saturday. I still need to quilt it and I'm not the best at binding. Considering it's size 21x12, how would a decorative stitch look on the edges rather than binding? It's a linen fabric. Besides a decorative stitch, any other suggestions? I don't want the binding to over power the embroidery. After you quilt it, you could use a facing rather than a binding. You could use ric rac trim to match the wording. You could almost use anything to do the border. Some type of pretty stitching, lace, tiny rope just to name a few. Good luck. I love the door hanging. Your Mom will get many comments on it. I'd probably use some interfacing, then back it... sewing it like a pillowcase. Letting the top be the opening and create a pocket for a small dowel. Does this make sense? I have no suggestions, but what a great idea. Have you seen Stupendous Stitching by Carol Ann Waugh? She uses decrorative stitches to bind. I used it on my door hanging to my quilting studio. I think I used a fusable batting type thing (thin), a back layer of fabric and stitched around the edges. It's great. I don't think I'd use a satin stitch on that. Since it is fairly small, you could birth it. Lay the top face up on top of your batting, lay the back face down on the top and stitch around the edge and leave a small opening for turning right side out. I think you could get it laying flat to add some quilting due to the size. Birthing is not my favourite method for a quilt but a small wallhanging is do-able. I'm with "hillcountrygal & tartan " brithing the wallhnging is a good way to go. But decrortives stitchs would look good to. your embroidery work is great. I hope someday I can get my to look this good. So it is up to you what ever you do will be love by your mother. HAPPY BIRTHDAY TO HER. Yes, Happy Birthday to your Mother! I'm no help on this decision but I do love the wall-hanging as she will!